Because I got a little distracted I’ve wrote a distress tweet. One of the answers I received was the straight tip from Dirk. Dirk: Eventually there is a folder or a virtual pad? I had a “Reporting” folder on the Root-layer. 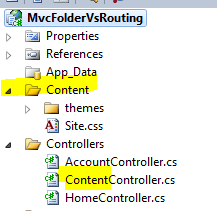 ASP.NET deflected the request to this folder and after it didn’t found an index.html or default.html it answers with a 404. All I had to do was renaming the folder and it works. A little demo project to show you the matter. 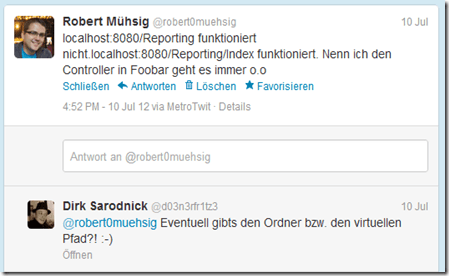 If you request localhost/Content it is going to end into the folder and there is nothing. 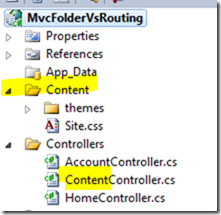 Only with Content/Index the MVC pipeline is activated and works properly. I assume that the ASP.NET pipeline prefers “static” objects and the mainly routing starts afterwards. The question is: Is it possible to switch this mechanism off or just unlock specific folders like Content, Scripts and everything else has to pass the routing? Let me know what you think about it.